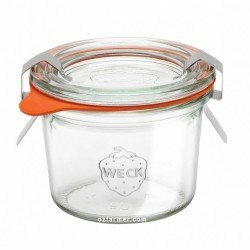 All Ball jars are available in cases. Most jars are packaged in cases of 12. The exceptions are the heritage jars (case of 6), the half gallon jars (case of 6) and the pint and a half jars (cases of 9). Where we sell cases of 6 of other jars, these are a full case cut in half. All cases of jars come with tin lids coated with a BPA free lining and steel bands. Jars have either a regular mouth (70mm) or a wide mouth (86mm). This mouth size is the same across all jars with that mouth type. All lids and bands are silver. All Ball jars are either embossed or quilted, with the exception of the smooth quarts which are completely plain and come with gold lids and bands.